We saw high turnouts for a midterm election this year, and South Carolina voters sent a clear message. Instead of voting along party lines, South Carolinians elected candidates from both parties who care about conservation – candidates who are determined to fight for a clean energy future and protect the air, land, and water we love. Last night we celebrated victories of proven champions like Peter McCoy (R-Charleston), Laurie Funderburk (D-Camden), and Robert L. Brown (D-Hollywood) who have all earned Green Tie awards for their leadership in protecting the rights of citizens to a clean and healthy environment, reforming our broken energy system, and fighting offshore drilling. 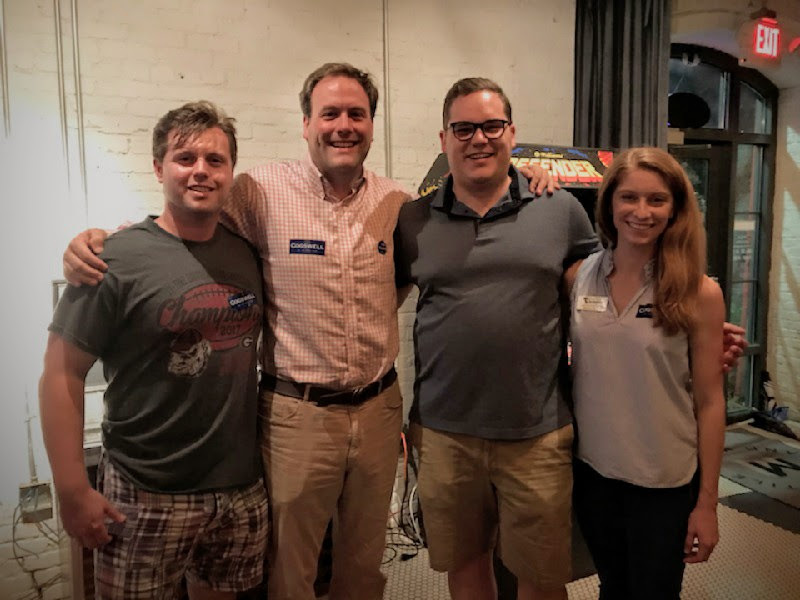 We saw the re-election of emerging conservation leaders like William Cogswell (R-Charleston) who broke with party leadership to rack up a 98% on our scorecard as a freshman. And we supported bids for newcomers like Kambrell Garvin (D-Columbia) and Randy Ligon (R-Chester) who have committed to fight for free-market competition in the energy sector and protect the landscapes that make South Carolina unique. CVSC Staff celebrating a victory in House Dist. 110 with Rep. William Cogswell. Unfortunately, it wasn’t all bright spots last night. We were disappointed that James Smith was not able to bring home the Governor’s office. But we remain committed to and inspired by his leadership of working across the aisle to fight for a clean and healthy environment for all South Carolinians. CVSC endorsed 27 candidates with general election competition, and we saw 25 of 27 deliver victory speeches to the people of their districts. That means over 92% of our endorsed candidates will join us in Columbia to fight for a brighter future for our state! We worked hard for our endorsed candidates because we believe in what they stand for. We met people in their communities by hosting events and knocking on thousands of doors. We helped spread the message of their conservation leadership through thousands of mail pieces. We reached countless South Carolinians through emails and social media posts. And we did it all with one goal in mind – continuing to build a bipartisan majority in the Statehouse. Last night, we achieved that goal. We helped elect the conservation champions that will defend your community’s right to decide for itself how to handle local issues like plastic bag pollution. We helped elect candidates who will continue to protect important land conservation programs like the South Carolina Conservation Bank. We helped elect candidates who will inject competition in the energy marketplace and pave the way for a clean energy future for our state. None of this was possible without you, the conservation-minded voters of the Palmetto State. Together we will work with our partners, some new, some known, to defend our future. Together we will work to defend the South Carolina we love. Thank you for such a strong showing at the polls. Your voice was heard yesterday, and we will fight to hold our elected officials accountable for the decisions they make in the coming years here in Columbia.